Casa Villa del Sol offers one of the finest private beach front vacation rental villas Cabo San Lucas has to offer. Perched on the very tip of Baja California, you'll enjoy incredible sunsets over the magnificent Pacific Ocean and awe inspiring sunrises above the deep blue Sea of Cortez. Cabo San Lucas is a spectacular vacation destination at the tip of the Baja Peninsula in Mexico. Scenic coasts, sunshine, warm ocean waves and a great variety of accommodations and activities draw crowds of vacationers from the US, Canada and many other Latin countries. Exclusive hotels and gated residential communities on the coast, between Cabo San Lucas and San Jose del Cabo attract a wide clientele of the rich and famous. Many of these properties, which are considered some of Latin America's top resorts, have become havens to Hollywood stars, Fortune 500 C.E.O.s and even the U.S. president during the 2002 Asia-Pacific Economic Conference (APEC). High-end resorts in the Corridor include the One and Only Palmilla, Esperanza and Las Ventanas. Sunshine and warm water draws more than tourists of the human kind; pods of whales also come to Cabo in the winter to bear their calves in the warm waters. Whale watching is a popular pastime in these parts. The largest marlin tournament in the world is held in Cabo San Lucas. Cabo San Lucas and San Jose del Cabo are served by Los Cabos International Airport. The town is also a popular port of call for many cruise ships. Cabo has a small international airfield, which handles air traffic for general aviation flights and air taxi service. In 1990 rocker Sammy Hagar of Van Halen opened a nightclub and restaurant, The Cabo Wabo Cantina, with the three other members of Van Halen. In the mid-nineties he bought out the other owners, his band-mates, and assumed complete ownership of the club. To this day it is one of the most popular attractions in Cabo San Lucas. He is known to play live at the club at least once a year with his band, The Wabos on his birthday, October 13, and shows often include many famous guests and friends from the music industry. Other clubs in Cabo include Mandala, El Squid Roe, Gigglin Marlin, NoWhere Bar, Tiki bar, and The Jungle Bar. Own a Condo or Villa in Cabo? 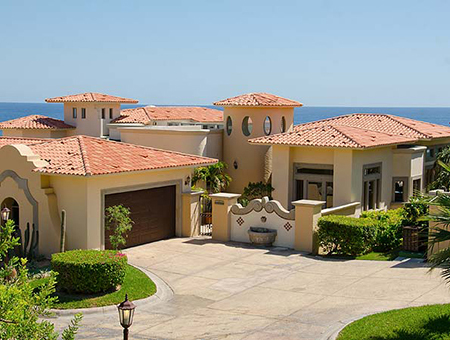 CaboPacific does not manage properties in Cabo San Lucas, we advertise them for owners and property managers. If you own or manage a vacation rental condo or villa in Los Cabos Mexico and would like to advertise on this site, please contact us for rate information.